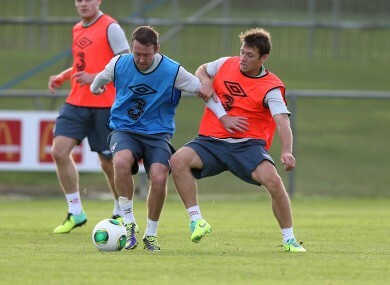 Scottish-born Aiden McGeady is tackled by Dubliner Wes Hoolahan at training this week. THE ENGLISH MEDIA have been falling over themselves this past week debating whether or not they should allow naturalised players to line out for their international team. The argument has stemmed from the FA’s decision to attempt to persuade talented Manchester United teenager Adnan Januzaj – who can play for Belgium, Kosovo, Albania, Serbia and Turkey – to represent England when he become eligible in 2018, with players, former players, coaches and journalists have all wading in. When Jack Charlton took over back in 1986, he went about exploiting FIFA’s ‘Granny Rule’ by seeking out players who were eligible to play through their Irish parents or grandparents. Greats such as Ray Houghton, Mick McCarthy, John Aldridge, Chris Hughton all earned caps that way while in recent years we’ve had the likes of Aiden McGeady, James McCarthy and Anthony Pilkington come on board. Below, we’ve decided to pick a ‘Homegrown’ team of Irish born current players and one made up of those born outside the island of Ireland. Just for the craic, like. Starting between the sticks, there isn’t a huge amount between Ireland’s No1 and No2. Manchester-born Westwood has become first choice at club level this season – albeit for a club in crisis Sunderland. Millwall’s David Forde, meanwhile, has been in good form in the Championship with Millwall. At a glance, the Homegrown side have a considerably stronger backline to their opponents. John O’Shea and Richard Dunne would be a better partnership than Ciaran Clark and St Ledger. Seamus Coleman and Marc Wilson are strong full-backs while opposite numbers Alex Pearse and Richard Keogh go in as makeshift. It gets interesting in midfield. I’ve gone for a four man for the Irish-born team – with Darron Gibson sitting, Wes Hoolahan given licence to get forward and wingers Robbie Brady and Andy Reid partrolling the flanks. Granny Rule have more protection with James McCarthy and Paul Green holding. That would mean the trio of Aiden McGeady, Simon Cox and Anthony Pilkington would need to get forward and create for lone striker Jon Walters. A front two of Shane Long and Robbie Keane would cause problems while Walter is always a handful for defenders but not exactly clinical in front of goal. Do you agree with the make-up of both teams? And who do you reckon would win? Email “How would an Ireland Homegrown XI get on against a Granny Rule XI?”. Feedback on “How would an Ireland Homegrown XI get on against a Granny Rule XI?”.